The bipartisan push for openness may result in a new era for citizen access to government information. The public can help that push gather momentum by encouraging their representatives in government to get behind it, by calling for the heads of agencies to enforce the Clinton administrations disclosure policy and by learning about and using the FOIA, said Kendrick Moxon, FOIA attorney. The Clinton administrations new policy of openness has put some muscle back into the Freedom of Information Act. Under the presidents direction, Attorney General Janet Reno issued a memorandum in October 1993 stating that the Department of Justice would no longer represent agencies in FOIA litigation simply because the information could legally be withheld under the act. The agency would have to show that actual harm would result if the information were released. But many still see room for improvement. Author and attorney Alexander Charns explained that while the Clinton policy change has resulted in the FBI releasing some documents to him during the course of ongoing FOIA litigation, the same cannot be said of the FBIs routine processing of FOIA requests. Certainly we have received documents which the agency claimed were released because of the new Clinton policy, Charns told Freedom. On the other hand, we have not seen any change in the glacial response from the FBI in the pre-litigation stage. The slow response is the same. Charns feels the problem consists of attitudes within the concerned agencies. Dan Metcalf, co-director of the Justice Departments Office of Information and Privacy Act, agrees that the attitudes at the agency level are very important, not only for the FOIA processors but for the people on which the FOIA staff rely, the actual custodians of the records. He said that the Justice Department has circulated a memo to all agencies pointing out the need for a shift in attitude toward openness and has ordered the dissemination of this memo to all FOIA personnel and those who affect FOIA processing. According to the Justice Department, a number of FOIA litigation cases have been quickly resolved due to the new policy. These include Institute for Policy Studies v. National Security Agency, Church of Scientology International v. Immigration and Naturalization Service, Weiner v. FBI and others. Despite these successes, however, many requesters feel that although FOIA policy has been greatly improved, the actual changes have not yet caught up. Many issues remain to be resolved in citizens efforts to gain access to government information, and new issues are bound to appear as the flow of information increases. 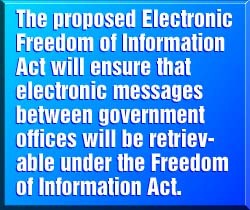 Because no one wishes to take action to curb the free flow of data on the information superhighway, measures must be extended to make it possible for an individual to gain access to information covered under the Freedom of Information Act, but contained in electronic files. Americans must understand what information is available to them and exercise their rights to obtain it. The current boom in government information was directly caused by such efforts from many individuals  inside and outside government. ate in 1994, Speaker of the House Newt Gingrich charged U.S. Rep. Vern Ehlers with the responsibility to make all important congressional information available on Internet. With the assistance of the House Information Service (HIS) this project has been completed, allowing citizens to have direct access to congressional information either through HIS or through the Library of Congress. Under this program, citizens can access the Congressional Record, text of bills, pending amendments, the U.S. Code and committee schedules. According to Rep. Ehlers office, it is planned to add other items, such as vote information and committee reports. The Internet address for HIS is: gopher.house.gov. The Internet address for the Library of Congress is: http://thomas.loc.gov.